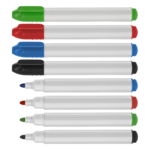 Non-permanent promotional marker pens are great for office and teaching environments where a white board is used for general discussions, training and idea generation. Perment types are also useful but only if you don’t want to wipe off the ink! We supply both permanent and erasable products and it’s important to make sure you know exactly the type you are going to offer to your clients. When you write with a perment pen onto a whiteboard it is almost impossible to fully remove the ink from the board. One of the quickest ways is to go over the markings and wipe of the ink before it dries but even this will leave a mark. We can supply both traditional and novelty dry markers and use either black or blue inks as well as custom ones on request. Please let us know if you need a sample one for evaluation. The imprint areas and ink colours are shown on each marker. There are two types of marker and care needs to be taken when deciding which one to use. If you don’t want to leave a permanent mark then you need a dry eraser marker. 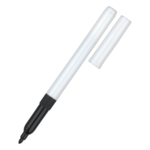 This is the most popular and widely used of its type and is ideal for using with white boards. You can write or draw on the whiteboard and whatever you put can be easily removed with a wiper, cloth or tissue. Dry ones can also be used to draw or write onto overhead transparencies and other materials where you only want a temporary mark, text or drawing. Permanent types are the ones to avoid if you only want a temporary mark. Never use a permanent pen on a whiteboard because you will not be able to remove the ink. It dries almost instantaneously. There is one trick you can quickly use and that is to go over the permanent ink you have placed on the whiteboard with a dry wipe one. The interaction of the two inks then allows you to wipe off both the permanent and the temporary ink marks. However, you may still be left with a diluted mark underneath on the whiteboard but at least it won’t be as visible. You should only use a permanent marker on items where you want the ink mark to be permanent. One of the most common uses for a permanent marker pen is on clothing where you could write a child’s name onto the name tag or suitcases when travelling to ensure your name cannot be removed. We have supplied thousands of both types of product for campaigns and clients within the public sector, private business, charities and sports and leisure industries. We have the standard basic shapes and also some novelty ones if you are looking for a product that is that extra bit edgy in appearance. These products really do help to make your brand and logo stand out. They are very functional products that will be kept for a long time due to their usefulness and the long shelf life or not-in-use life they have and would be a welcome addition for any office, school, college or university or sports club environment. If you would like to see examples from pens supplied to clients for previous marketing campaigns then please do contact us. We supply free samples and can arrange to send them to you. If you do not have the right artwork our in-house Design Studio can help to generate this for you to ensure perfect branding as our printers apply your artwork to your chosen pen. Also please remember our Price Match guarantee. We will not be beaten on price for a like-for-like comparative product so if you do find one and want the best service in the industry please do let us know. Our website only shows a small selection of what we can supply. If you need more examples or ideas let us know and we can provide these from our supply chain and sources. Where can you brand on a marker pen? As with other pens, the barrel is often the most used place on a market pen for an imprint. We can also look to brand the packaging of the marker pen for clients who want a custom print run. What colour marker pens do you supply? The typical marker pen colour ink is black or blue with red and green options. Non-standard colours may also be available for a custom manufacturing run. 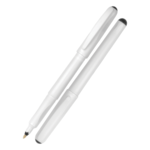 We can supply both types of marker pen. Erasable marker pens are suitable for whiteboards. Non-erasable markers can be used to make permanent marks on items such as a name on a piece of luggage.